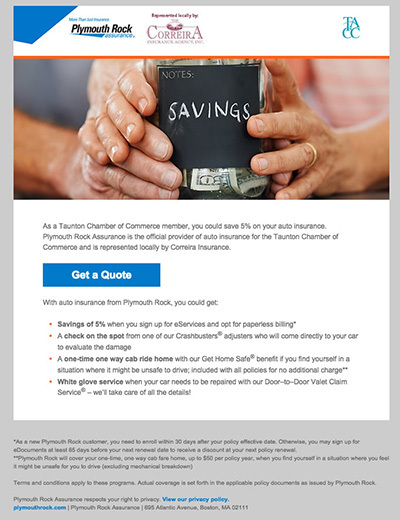 An Exciting new program offered By Correira Insurance and Plymouth Rock Assurance to Members of the Taunton Area Chamber of Commerce and their employees. Members save 5% on auto and 5% on homeowners insurance! Click on the image below and receive a free quote. Please click HERE for a comparison from several quality Auto insurance carriers. For even more personalized service use our links below. Get a Competitive Insurance Quote! Use our online Quick Quote form - it's fast and easy. Takes less than 5 minutes to complete! Use the menu above for a complete list of insurances available or click on the images below for a quick homeowners Insurance, auto insurance or business insurance quote. We are a little old fashioned, if you want something done quickly, we will do everything we can to assist. Customer service is of paramount importance to us. Our customers recommend us to their friends. Our expertise is based on well-trained experienced staff that can tailor a comprehensive insurance program for your specific needs. 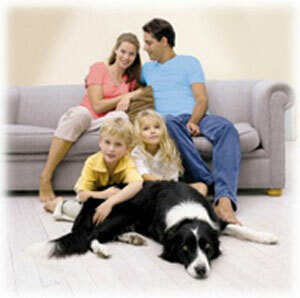 You will have the added benefit of working with insurance agents who understand your needs. Finding the right insurance policy is only the beginning. Remember to make a copy of your auto registration. If you loose the original you will save $25 for a copy at the registry.